I love serving fish for dinner…it’s healthy, full of protein, and usually pretty low in Weight Watchers Points. Also, the fact that it cooks super fast makes it ideal for those busy weeknights. Sometimes, I get fancy with fish recipes, and other times I just like to keep it simple. This Spiced Oven Roasted Cod Recipe is one of the simple ones – minimal prep work, minimal ingredients, and the end result is lovely and delicious. 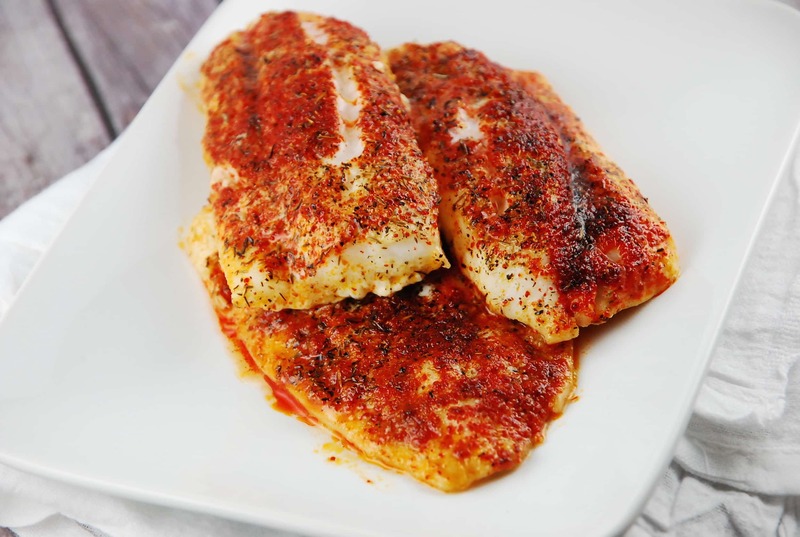 The bold spice blend gives the mild cod a perfect kick of flavor! Pair this with some roasted vegetables, and a rice dish or low calorie soup for a complete meal. Enjoy! Tender, moist, and wonderfully flavored, this oven roasted cod is a perfectly simple, high protein dish that makes a great Weight Watchers dinner recipe at just 3 Points per serving. It’s quick and easy to prepare too, so it’s ideal for a busy weeknight. Preheat oven to 400 degrees. Mist a baking dish with cooking spray or an olive oil mister. In a small bowl, combine paprika, garlic powder, old bay seasoning, theme, salt and pepper. Place fish fillets in the baking dish, squirt with lemon juice and brush with olive oil. Then rub the seasoning mix evenly all over. Roast in oven for about 12-15 minutes, or until fish is cooked through. HI, THIS RECIPE SOUNDS FABULOUS. JUST ONE THING, I HAVE NEVER HEARD OF “OLD BAY SEASONING” BFORE. CAN YOU PLEASE ADVISE A COMPARABLE SEASONING OR THE CONTENTS OF IT. I LIVE IN NEW ZEALAND. I LOVE YOUR RECIPES. THANKS SO MUCH. JENI. I am wondering the same thing. What is “Old Bay Seasoning”?